A few weeks ago, my friend Suzi donated some aprons for my Blog Anniversary Celebration. This week, I’m paying it forward to help out one of Suzi’s great causes – The Avon Walk for Breast Cancer. Suzi is fundraising and walking in the 2013 DC walk. That’s 39 miles in two days! (And here I am complaining about training for a 5k run…) This will be her FOURTH year participating in the walk. As part of the Mountain Momma’s Fundraising, they have been participating in a few local events. This Saturday, the ladies will be in Shepherdstown WV at the Freedom Run (man, I wish I were ready for this). They will be taking donations for baked goods – including these cake pops! You know who is also donating?? Carrie from The Sweet Life. She will be donating some Cake Truffles for the cause. Aren’t those pretty? Making these simple, yet elegant, Cake Pops is easy! As I was making my cake pop batter, I added in some hot pink nonpareils. To see a video on making cake pop batter, CLICK HERE! Once they were dipped and dry, I added some pink Luster Dust and Silver Luster Dust to the pops to give them a pretty shimmer. I have a video on adding Luster Dust HERE. When they were all painted, I re-melted the pink candy and added the Pink Ribbon design on the pop. The white cake pops got Hot Pink Sprinkles and the pink pops got Pale Pink Sprinkles. I think they turned out super FAB! And I LOVE the pink surprize inside the cake pops as well! If you would like to help Suzi and the Mountain Momma’s raise money for the Avon 2-Day Walk for Breast Cancer, please click HERE. ALSO – I’ve teamed up with the Mountain Mommas for a 50/50 fundraiser for their Avon Breast Cancer Walk. 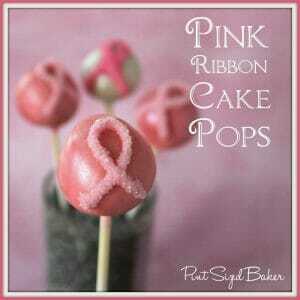 We’ll be selling a dozen Pink Ribbon Cake Pops for $20 and giving HALF to the team. If you would like your pops in a pretty Pink Container to display at work or home, the Pink Cake Pop Display will be $25. Of course, don’t limit yourself to just a dozen. Everyone loves cake pops – share them and help promote a great cause. Simply send me an e-mail to place your order. Shipping for pops is available and is variable depending on weight and destination. I am not able to ship the pretty containers. Sorry. Bake Cake and allow to cool. Cut 1/3 of the cake and mix with paddle attachment with frosting. Add in desired amount of Hot Pink Nonpareils. I used maybe 1 1/2 Tablespoons. Form 12 balls using a cookie scoop and roll smooth. Place in fridge while melting candy melts. Melt Candy Melts in separate ceramic containers being careful not to overheat them. Dip 1/4 inch of lollipop stick into candy and then add cake ball. Six sticks into White and six sticks into Pink. Dip Cake Pops straight down and back up again, coating completely, and allowing the excess to drip off. Stand up in cake pop stand. Six White Pops and six Pink Pops. Paint on Luster Dust with a DRY brush. See videos (http://pintsizedbaker.blogspot.com/p/pint-sized-videos_29.html) here. The pink got “pinker” and the white took on a pearl look. Put a small amount of Pink Candy into a baggie and snip off an edge. Draw on a Ribbon design and then sprinkle with Sugar Crystals. I put the Hot Pink on the white pops and Pale Pink on the pink pops. Stand up and allow to dry. That's an impressive walk. I don't think I could do it! These pops are great, and what a great cause! I think you could. I KNOW we could! Wow, 39 miles! That's impressive but I'm getting winded thinking about it. What a great cause. I bought a few buttons & pins for myself and the ladies I work with so we can show our support long after October is gone. Yay to celebrating more birthdays! I hope you & your family have a great weekend. Thanks for stopping by. Suzi is a great lady and she's walking for a lot of friends. Such a great cause, it is wonderful that you are supporting your friend in fundraising. The cake pops are adorable. Tomorrow is our neighborhood cancer walk that I chair, sure wish we had a few of those for dessert! You're welcome! Always happy to pop on over and link up. Hope all went well with your community walk. I'd love to have you link up at my Weekend party! I just linked up. Thanks for the invite. I love paying it forward. It was so great reading your blog post. I am so in love with the Breast Cancer's new logo, "Help save second base". Thank you so much for sharing this at Foodie Friends Friday. Quick question: If the pops are put in a plastic baggy, will the luster dust rub off? Great cake pops and a great cause! You always make such impressive cake pops, Karyn! I love your work! And your so generous about sharing your knowledge. That's why I referred my readers to your tutorials in my Spider Cake Pops post this week. Thanks for all the inspiration! Love the pretty cake pops! i will definitely watch the video on how to make them. I attempted about 2 years back and it was a complete fail. never tried them again. But i will this halloween! Thanks for sharing! I SERIOUSLY love this post! We love having you at Whimsy Wednesday! I grabbed your button because I want to find my way back here. I must try the cake pops I bet kids love them. I am featuring your Pink Ribbon Cake Pops and your Post on my Face Book Page. Thank you so much for sharing with Full Plate Thursday and Thank You for being one of the caring ones! These are wonderful! Would love if you linked up on my blog hop http://www.w-t-fab.com/search/label/bloghop. Also let me know if you'd like to follow each other! These are beautiful Karyn! Featuring tonight! Thank you so much for sharing your creativity at Mom On Timeout. Hope to see you back tonight!